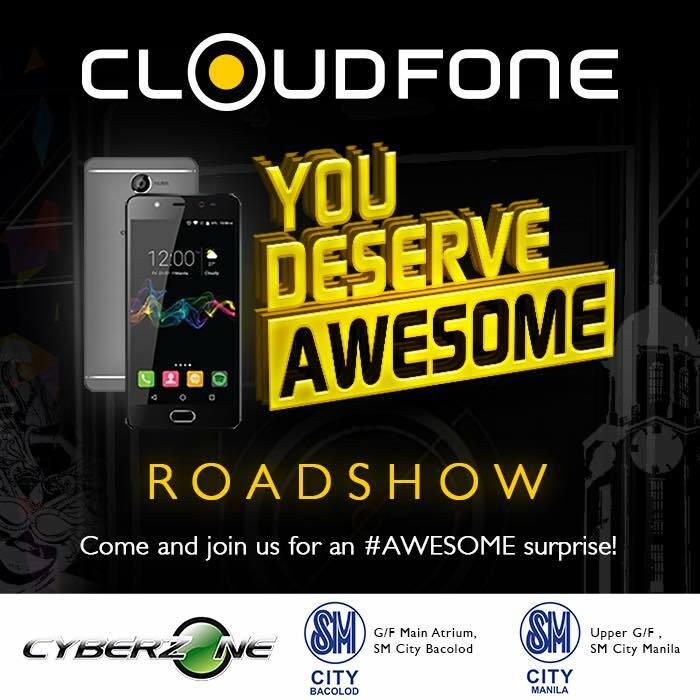 After the successful kickoff event in SM City Pampanga, Cloudfone takes its exciting You Deserve Awesome Roadshow to the City of Smiles, Bacolod. At SM City Bacolod, delight in the fun-filled weekend event wherein mall-goers are invited to experience firsthand what awesome is all about. Check out the different activity stations and discover the different ways Cloudfone brings more fun to your mobile experience. Get exclusive offers, win special prizes and freebies, and discover the new sleek designs and devices. As one of the fast-rising mobile companies in the country, Cloudfone promises its users premium, value-for-money devices that complement every lifestyle. Head to the Awesome Selfie Station, where you can take fun photos at the 3D Art Wall. Upload your photos on Facebook and Instagram with the official hashtag #AwesomeCloudfoneSelfie (Don’t forget to tag Cloudfone too!) to share it with friends and the rest of the Cloudfone Community. Watch out for roving Cloudfone photo booths as well to get your own Instaprints as your souvenir! Done in collaboration with Cloudfone’s partner, Spotify, you also visit the Awesome Music Station, that lets you experience the full, crisp audio capabilities of Cloudfone devices. Here, you can have yourself digitally lip-synching and dancing to the tunes. After your award-winning performance, you can watch it on the devices provided or download the video straight to your own device. To help you experience the enduring power of Cloudfone, the Awesome Games Station allows you to play games to your heart’s content. Challenge other players and battle it out on smartphones available at the booth. Be impressed by the crystal clear display, ease and performance of Cloudfone’s powerful gaming devices. Your choice; your play. Once you’ve seen it all and want to own one yourself, grab your NEXT Cloudfone and get special exclusive bundles at the You Deserve Awesome Sales Station. Experience awesome yourself at SM City Bacolod Ground Floor Activity Center this November.